All professional truck drivers are required to perform a pre-trip inspection before each trip. One very important part of this inspection is checking the tires. While certain things like tread wear, bulges and cuts may stand out, sometimes tire pressure can get skimmed over. As it turns out, proper inflation can not only slow down tire wear and prevent things like bulges. It can also mean more money for the driver. Yes! PAM Transport truck drivers earned over $600,000 in cash and prizes last year for being in the top of their peers when it comes to fuel-efficiency. And every one of the top drivers will tell you a large part of being fuel efficient has to do with their truck’s tires – particularly making sure they’re properly inflated. So how did they qualify for the extra money and prizes? It’s easy - these drivers simply took advantage of PAM Transport’s MISSION MPG program. 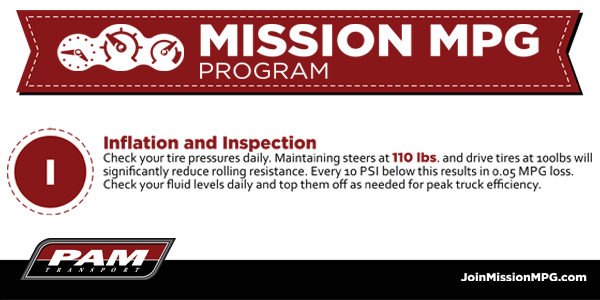 Simply put, MISSION MPG is a program that rewards PAM Transport drivers for being fuel-efficient with bonuses and prizes.. Each letter in the MISSION represents a particular tip that when put into practice will increase the number of miles a driver gets each time they fill up. Reduce Speed. Improve Fuel Efficiency. Earn Money.